So far I was pretty good about doing my “homework” in advance of this trip. 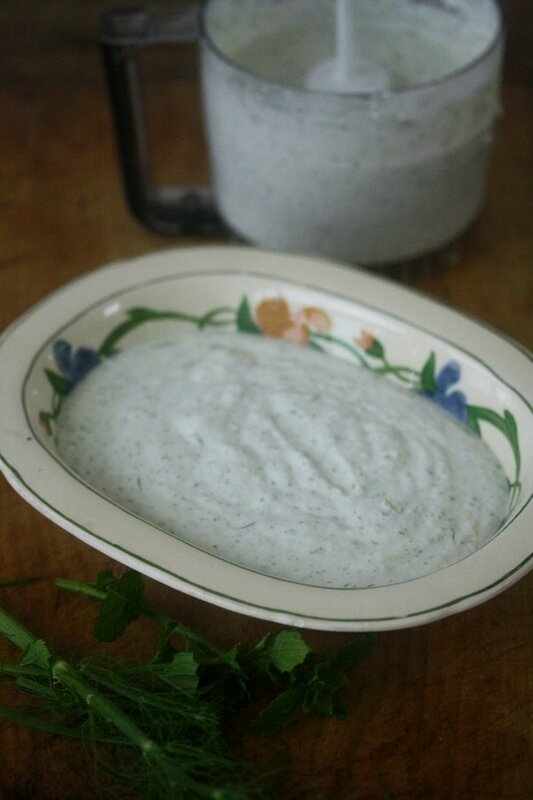 But this little ditty on Tzatziki seems to have gotten procrastinated until right now. So forgive me if I keep this brief. Whenever I cater, I like to have at least one dip for the coffee table – usually a meze platter or crudités, really anything where you can mix and match colors and serve things rustically. Recently I’ve been really into varying the heights of the table by putting certain veggies in tall boys or tumblers. When I was on the vineyard and my parents and I hosted a joint dinner party, I did just that with a bowl of tzatziki and some hummus my mother made. Earlier that week I spotted a fennel pesto at my favorite local market, Morning Glory Farm. I rarely buy store bought items, especially on the vineyard where I’m cooking constantly. But I thought this was incredibly intriguing – and it was. 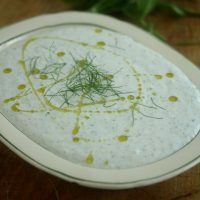 The dip was packed with fronds, and I got the idea to do something similar for a tzatziki dip by swapping out the dill for fronds and adding fennel in addition to cucumber. 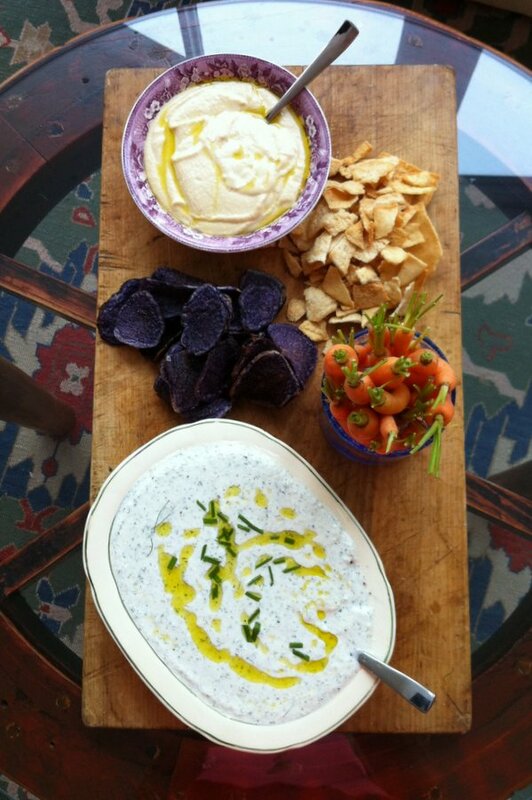 I will hopefully be eating some delicious Mediterranean things like this dip once I make it to Ibiza tomorrow. Wish me luck on making it out of Barcelona alive…or, at least, without the plague. In a food processor, pulse the fennel, fronds, and garlic until finely chopped. Add the cucumber, mint, yogurt, lemon, vinegar, and salt. Puree until the cucumber is finely chopped and the mixture is well combined. Transfer the tzatziki to a serving bowl. Taste for seasoning. 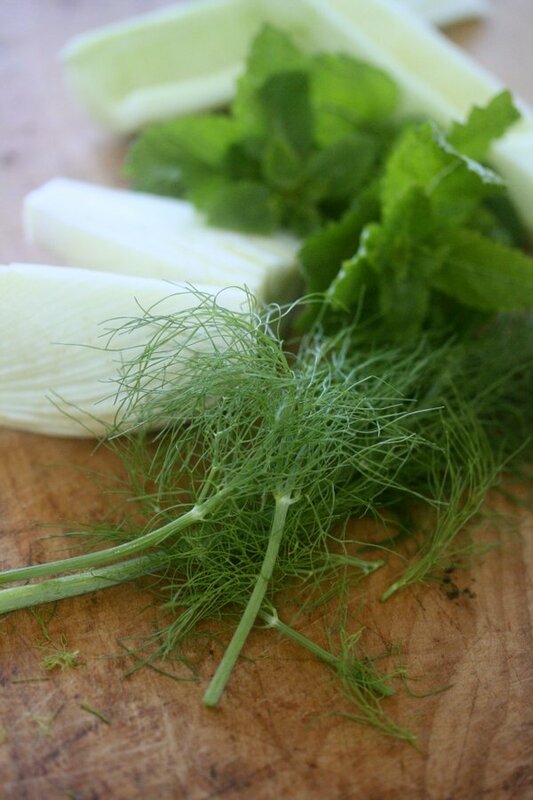 Garnish with more fennel fronds and serve alongside grilled meats, fish, or chicken. 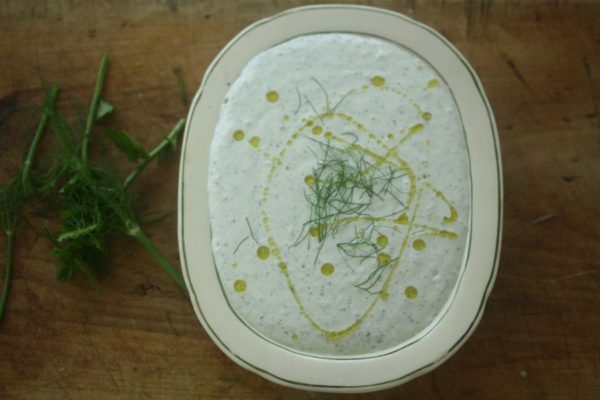 I could eat tzatziki every day of my life – LOVE that you used fennel and mint!! Hi Phoebe – found you through SummerFest. Great dish, love how you present it on the cutting board. looks and sounds delicious! i love how quick and easy this is. Ohhhhhh I’m excited about this. Seems impossible, but I get tired of ranch. Seriously. oooo I hadn’t even thought of this as a ranch alternative, but it could be!! Maybe thin out with a little bit of water and you can even use it as a dressing. Report back! Hope you’re surviving navigating out of Barcelona! 🙂 This sounds awesome, lady – I want!! I am so behind on my cucumber reading. 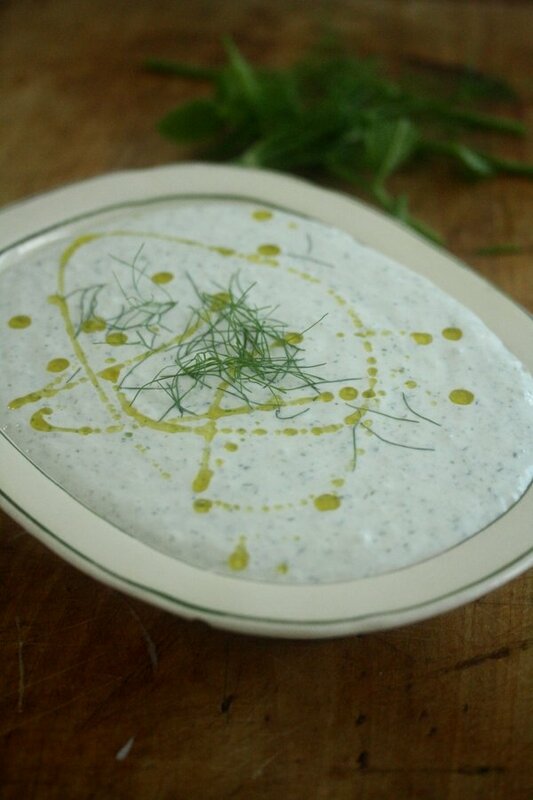 I really like the use of fennel in your tzatziki. 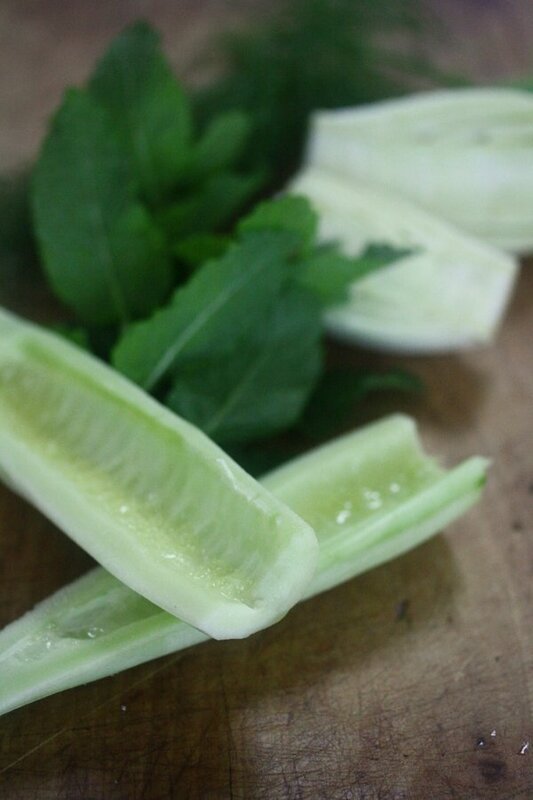 I use fennel often in salads and baking with savory dishes, it really sparks up a dish. 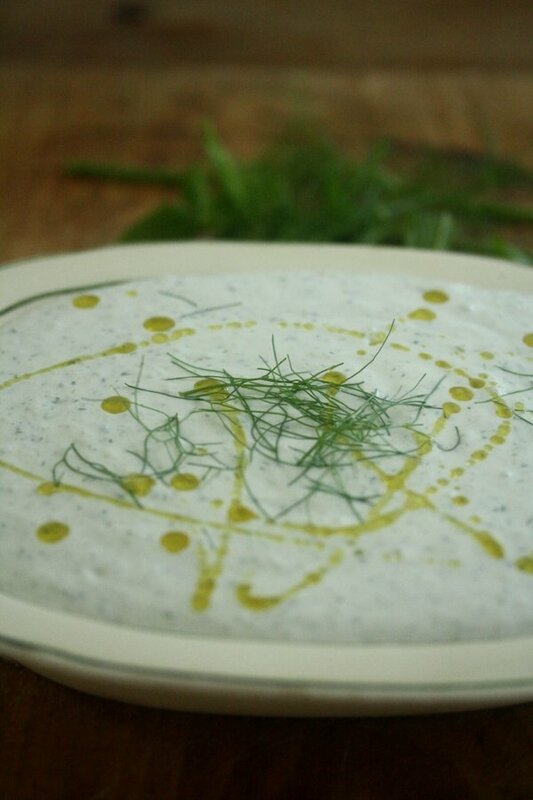 Tzatziki is a great side dish to have on hand to serve with many items, isn’t it? 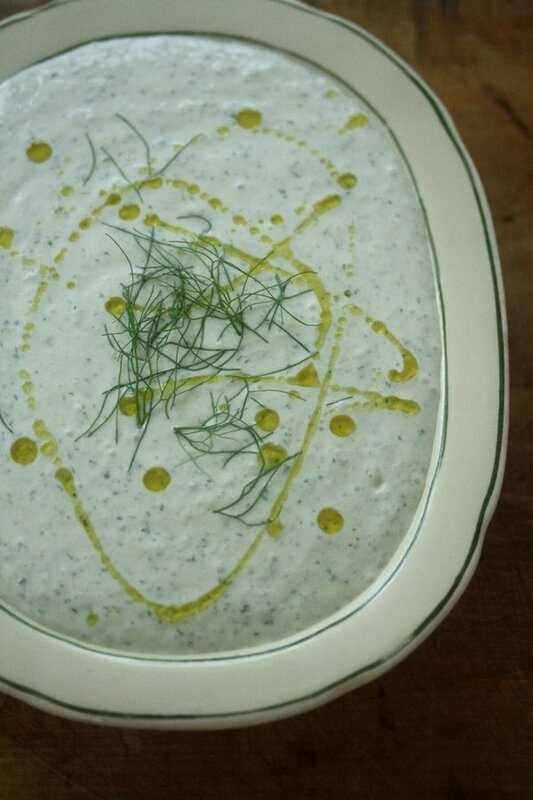 I just made one this week with cucumber, mint and dill, if I had fennel I would have added that! Thanks for the inspiration. My god-daughter and her family are moving to Barcelona in a couple weeks – I cannot wait to go visit!! Have been to Europe many times but never Spain.